The Bible for Children, Book by Book. The Amazing Adventure is a 400 page children’s curriculum developed by Big Dream Ministries for children who are preschool through eight years of age. The curriculum takes the child through every book in the Bible in a sequential manner. Each weekly lesson includes a story, suggested activities and crafts, color pages and a memory verse. A “Take Home” page is also included for the parent with suggestions on how to pray for the child, special activities the family can enjoy and a brief statement about the lesson taught that week. It can be used for preschool child care classes that are held as the adult small groups study The Amazing Collection: The Bible Book By Book, or can be used for Sunday School Curriculum, family Bible devotions and activities, and for Home School Bible Studies. 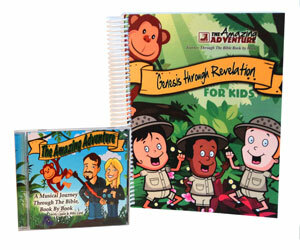 Each curriculum book includes “The Amazing Adventure: A Musical Journey through the Bible Book by Book” CD. “The Amazing Adventure: A Musical Journey through the Bible Book by Book” was written, produced and sung by Billy and Cassie Lord and includes 12 songs that teach children the Bible book by book. It may be purchased separately.